The J.C. Van Horne Bridge started being built in 1958 with the completion date being at the onset of October, 1961 and traffic officially began crossing the bridge on October 15, 1961. 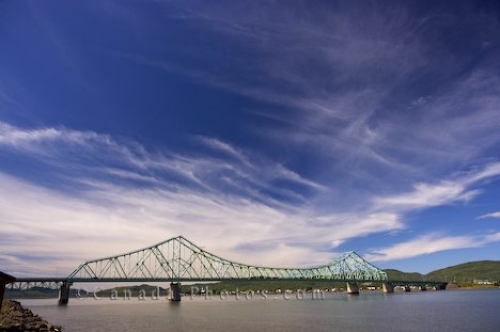 The J.C. Van Horne Bridge crosses the Restigouche River between the town of Campellton, New Brunswick and Pointe-a-la-Croix , Quebec. The J.C. Van Horne Bridge across the Restigouche River in the town of Campbellton, Appalachian Range Route, Highway 11, Restigouche, New Brunswick, Canada. Picture of the J.C. Van Horne Bridge that spans the Restigouche River in Campbellton, New Brunswick in Canada.